This past weekend I was in Washington, DC for a wedding. My husband and I stopped for lunch to enjoy some of the blue claw crabs that the area is so famous for. 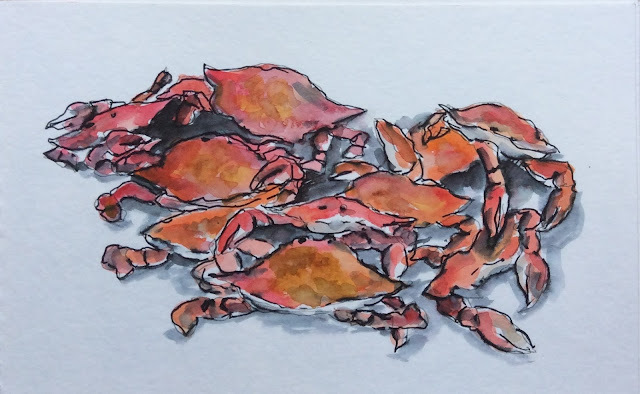 The crabs were hot so I didn't mind waiting to chow down and sketch while they cooled. The wedding was at the St Regis where we stayed. I just had to sketch a part of the plush lobby. The wedding was Saturday night, so the bride's father arranged for a bus tour in the morning for anyone interested. Armed with my sketchbook I tried to capture some of our stops. I was also able to get a stamp from a booth at each of the locations I sketched. First up was the World War II Memorial. I didn't get to hear what the tour guide was saying but I sketched a part of the memorial. We had my 94 year old father-in-law with us and he received a very special welcome on arrival. 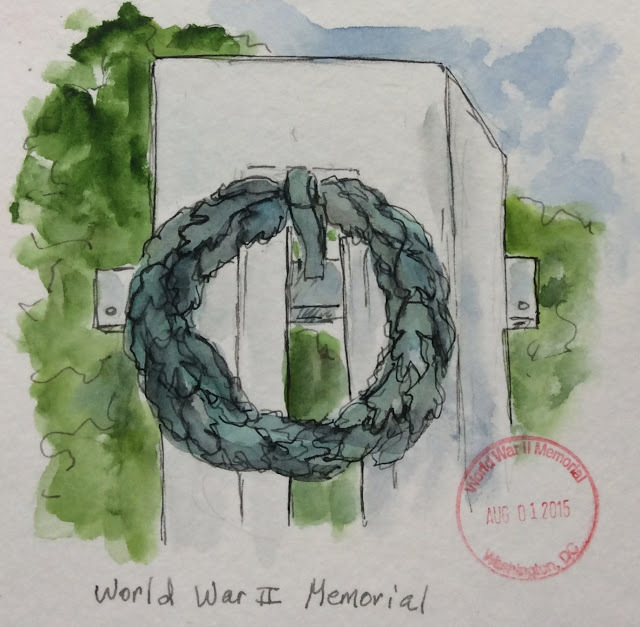 The guide from the memorial thanked him for his service and spoke to him about where he served during the war. I know we were all touched to see him light up. 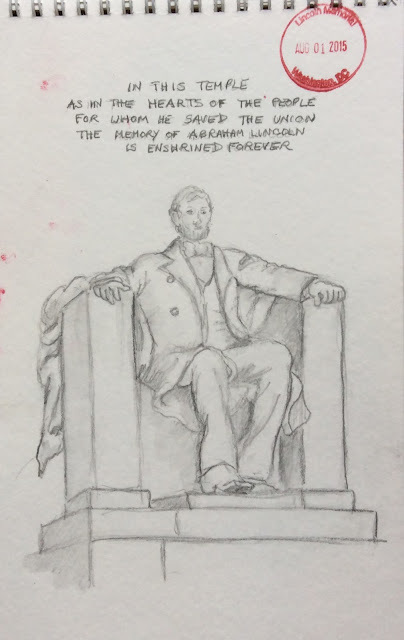 Next the group went to the Korean War Memorial, but I HAD to run off because I knew I wanted to sketch the Lincoln Memorial. I told them I would meet them there. I know my sister-in-law (mother of the groom) was worried they wouldn't see me there, but I was right on time. 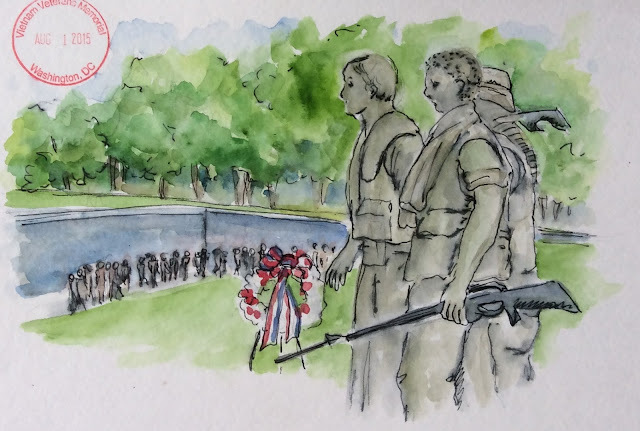 My last sketch was done by the statue at the entrance to the Viet Nam Memorial. 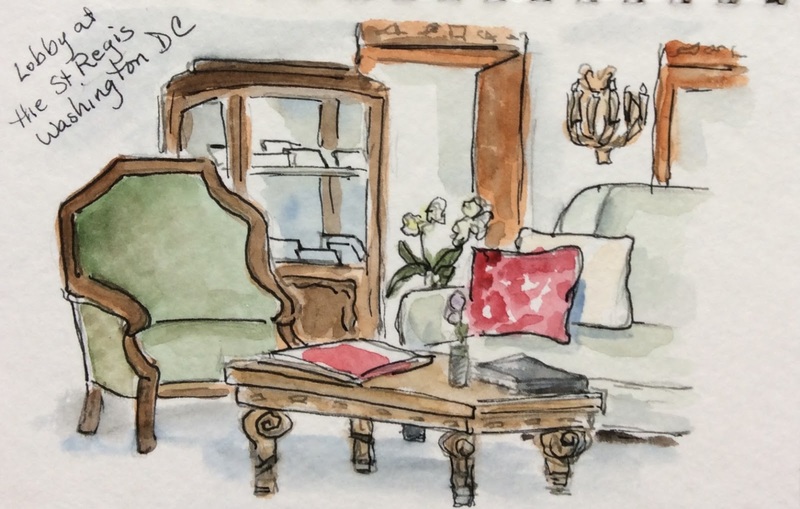 As much as I would have loved to sketch at each stop it just wasn't possible. Fabulous sketches as always Joan. PS loved the crabs! LOL I loved the crabs in more ways than one. Thanks!